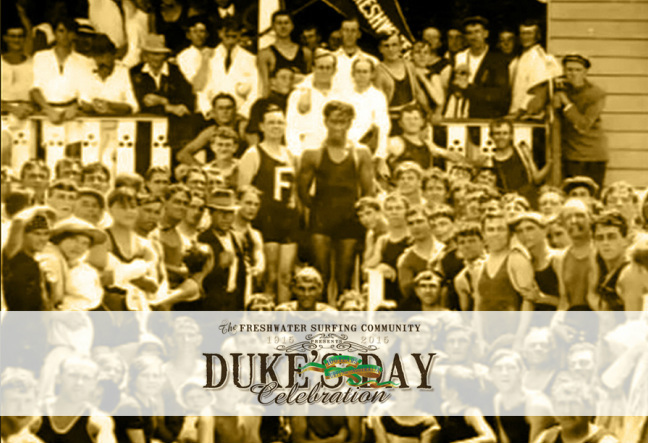 Duke's Day is a day to honour & revere the father of surfing in Australia -Duke Kahanamoku. It is a day to raise awareness, kindness and living in harmony with the coastal environment much in the way of Dukes philosophy. The Duke's Day events have been planned as a fabulous festival over the anniversary of Duke’s first Australian surfing demonstration (or nearest Saturday), and is organised by the Surf Nomes with support from Freshwater SLSC, Eco Divers and the Freshwater Boardriding Clubs on behalf of the wider Surfing Community. The inaugural Duke's Day was held on Saturday 15th January 2011.